I’m always on the lookout for Ace Doubles, the two-in-one books that brought many pulp era novellas to readers in the 1960s. Earlier this week I finished Robert Silverberg’s The Silent Invaders, which was paired with War on Venus, by author William F. Temple (which I haven’t yet read). Under the editorship of Donald Wollheim, Ace published a staggering number of science fiction doubles, but also put out lots of westerns and mysteries. This double, Ladder in the Sky is by John Brunner, the author of the book I’m currently reading, The Atlantic Abomination (see below). The art is uncredited, but probably by Ed Emshwiller, who handled a large number of the science-fiction double covers of the era. Brunner was British, and Wollheim populated his doubles with a large number of stories by British authors, occasionally as reprints from UK magazines but often wholly original books. 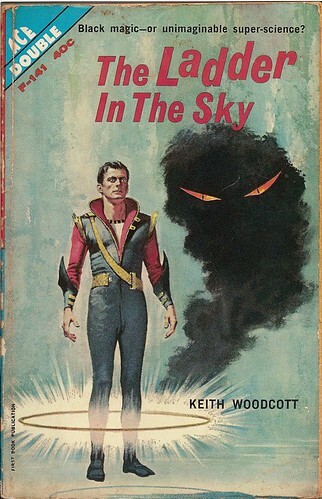 I have no idea why the “Keith Woodcott” pseudonym was used on this one, but it’s possible that it was used to disguise the sheer number of Brunner stories showing up in the doubles at the time. As I mentioned below, Brunner is on my “buy on sight” list due to the strength of The Traveler in Black, but I confess I bought this one by happenstance. The other side of this novel is The Darkness Before Tomorrow, by Robert Moore Williams. Unlike Brunner, Robert Moore Williams is not a very good writer, but his cliché-ridden stories are near-masterpieces of madcap entertainment. I’ve been buying those on sight for years, and this rare John Brunner gem got caught up in the net. So far on Paperback Flash I’ve managed daily posts for 11 consecutive days. In that time I’ve also managed to acquire about three dozen additional paperbacks, which I will try to scan later this upcoming week. I haven’t yet decided what I’m going to read after The Atlantic Abomination, but given the quality (and outlandishness) of the books I’ve hauled in recently, I certainly have plenty of entertaining options.